Looking at the day 3 itinerary, I was excited to see that we were going to be visiting some choice locations around Newport at a nice leisurely pace. We started with a light breakfast and coffee at the Pirate Coffee Company in Depoe Bay. In case you didn’t know, pirates are big in Oregon. 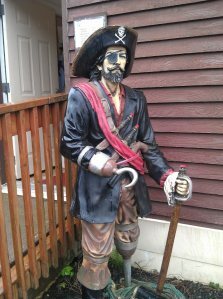 We have pirate festivals, pirate themed restaurants and coffee shops, pirate stores, pirate you name it we got it. Goes way before and beyond anything Johnny Depp could claim responsibility for. The coffee and muffin I had where delicious. They roast their own coffee and you can taste the freshness. As a dyed in the wool Portland coffee snob, I appreciated this greatly. Prior to this morning I had heard some casual ribbing directed in Roy’s direction about staying off the caffeine and sugar. I didn’t pay much attention to it until Roy decided to order one of those giant 5000 calorie specialty coffee drinks. As I recall, he also ordered a variety of breakfast pastries. It was only when I saw Allen’s eyes widen like saucers at the arrival of Roy’s breakfast did I realize the previous day’s chatter wasn’t ribbing; it was a series of subtle pleas for mercy hidden behind uncomfortable laughter. I mentioned briefly in the day 1 blog post of this trip that Roy is naturally a high energy character. As it turns out, the addition of sugar and caffeine do in fact kick him up into the stratosphere. Have you ever seen those parents at the park sitting on the bench and looking up at the sky while their kid circles them in an unidentifiable blur? If you have kids you know that those parents are working out some form of bargain with their higher power. Looking sullenly through exhausted eyes to the heavens, they want nothing more than for the ball of energy before them to take a nap, or at the very least go torture someone else for 5 minutes. Roy on sugar and caffeine = uncontainable playground child. We left the Pirate Coffee Company and were originally supposed to be bound for the Yaquina Head Outstanding Natural Area. Again, the weather swatted our plans to the ground. Luckily I have visited this dandy a number of times before and even penned an article about it. We stopped at Cape Foulweather for what would have been a great photo op had the weather not been so foul. 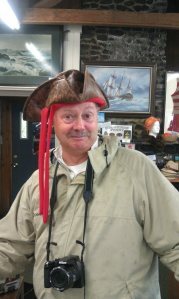 We did make our way into the gift shop, however, where Roy, inspired by breakfast purchased a pirate hat. He then informed us that today was “Pirate Day….Arrrr”. Good enough. We re-bused and left for the Oregon Coast Aquarium. The Oregon Coast Aquarium is ranked as one of the top 10 aquariums in the nation, and it deserves it. 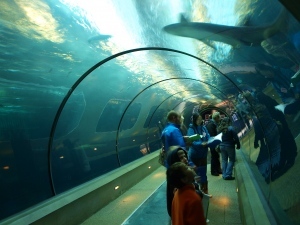 The Aquarium boasts a ton of world class exhibits and educational programs. I recommend taking at least half a day for this place. We were given ample time to walk around and explore, which was great. But we also had a special treat lined up for us. We met Public Relations Manager, Cindy Hanson, and went behind the scenes to get sea lion kisses. Yep, we all lined up and got kissed by Lea the sea lion. 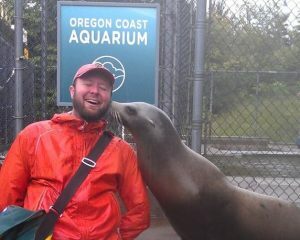 Say what you will, but you can’t escape how cute people think a sea lion kiss is. On my Facebook page I have posted many high resolution pictures of sunsets, waterfalls, food, drink, and much more. None of them have ever garnered as many “likes” as the cell phone pic Lucy took of Lea kissing my bearded face. 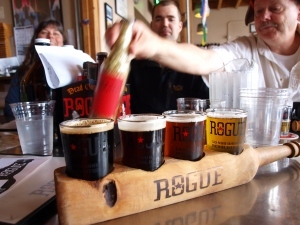 Lunch was at the Rogue Ales Brewery. We were joined for lunch by Jim Cline, VP/GM – Director of BS (Beer Sales). That’s kind of funny. We enjoyed beer samples, a wonderful lunch, and inspiring pirate-themed conversation. After lunch we where given a tour of the Brewery which just reinforced my love for Rogue and not only their beer, but also how they handle their business. Next up was a Sea Life Cruise courtesy of Marine Discovery Tours. We had the privilege of joining a rather large middle school field trip. The staff was knowledgeable, friendly, and handled the kids extremely well. The sun also decided to make its debut as we were boarding; a stroke of luck I did not take for granted. It was fun to watch the kids haul in nets and buckets of sea life of varying sizes. 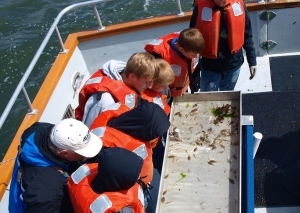 With the help of staff, the kids would then identify the creatures and the roles they play within the ocean’s tapestry of life. This was a blast, made even blastier by the fact that I was on a boat in the sun! When we came back in to the docks we where treated to a tour of the Anchor Pier Lodge that nests right above the dock for the Marine Discovery Tours. The rooms where incredibly cozy and meticulously detailed B&B style; with each room possessing its own name and character. Below the Lodge was the Surf Town Coffee Company. This place wasn’t a scheduled stop, but owner, Brendan Mathews, opened the shop just to make us coffee drinks when he saw the caffeine-starved looks in our eyes. Brendan also roasts his own coffee on site and gave us an impromptu presentation about coffee roasting and his shop. This was an unexpected treat as both the presentation and the coffee where great. It was then time to check into our accommodations for the evening. We where staying at the Elizabeth Street Inn on the beach in Newport. For some reason sleeping in places right on the beach just isn’t getting old. After checking in and freshening up, we loaded back into the van and headed for the picturesque Newport Bayfront. Dinner that night was provided by Ocean Bleu @ Gino’s, and it was pretty much amazing. 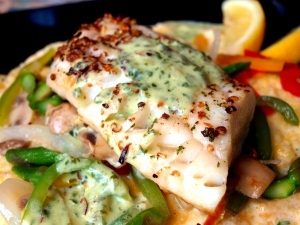 Enjoying dishes expertly prepared with fish caught that day in the waters you were just in, is not a bad way to end the day. After dinner we enjoyed a driving tour of the eclectic Nye Beach neighborhood before returning to the Elizabeth Street Inn. Check out the next morning was at 8:30 am.